Feb 2 2018 (IPS) - In the United States, the 21 young people who are plaintiffs in the case Juliana v. United States will soon make their case against the government for failing to take action against climate change. Similar lawsuits have been filed in countries including Portugal, India, and Pakistan. And in the 2017 Bonn climate change conference, a 12-year-old Fijian boy whose village had completely been devastated by cyclone linked to climate change, addressed negotiators and urged them to find solutions to the changing climate. Sadly, these children are outliers and millions of their peers in other parts of the world, including children from sub-Saharan African countries, will never have the chance to tell the world how climate change harms them. All too often, children are the unseen victims of climate change. Policy makers and development organizations agree and have documented evidence that when properly implemented school feeding programs serve as incentives for children to attend and stay at school. And because they are not hungry, children can focus on their studies resulting in better performance. According to UNICEF in 2017, 175,000 children were not attending primary and pre-primary school as a result of the food shortage in 10 counties and a further 1.2 million children in Kenya were in need of education assistance. The report further states that more than 100,000 children aged less than five years need treatment for severe acute malnutrition. In Malawi and Mozambique and Madagascar, with little or no food to feed the families and income to pay for the girls school fees, parents have been forced to marry off young girls as young as 13 years to ease of the pressure from the family. 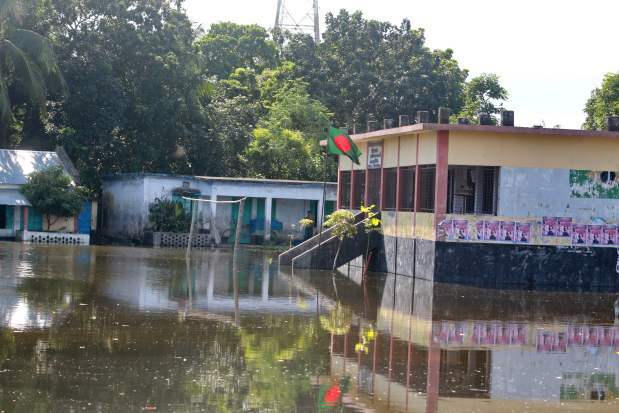 In Bangladesh, rising sea levels and flooding linked to climate change is reported to be destroying children’s futures with tens of millions of children and their families at risk of losing their homes, land and livelihoods. Despite being directly affected by climate change, children’s plight is not addressed by the major stakeholders in the climate change negotiations including the UNFCCC, World Bank, African Development Bank Africa Climate Change Fund and country government climate mitigation plans. Further, even though they were invited to attend and organize events at the UN Framework Convention on Climate Change (UNFCCC) meetings, established institutions, organizations and leaders see them as observers rather than collaborators. As a matter of fact, many of the climate change adaptation and resilience programs in Africa and the global world rarely dedicate sections to think through about the plight of children. An in-depth look at recently launched initiatives by United Nations Development Programme, African Development Bank Group, World Meteorological Organization, the Government of Uganda, the Government of Malawi — an initiative to be funded by The World Bank and African Development Bank, the Government of Kenya, the Government of Sierra Leone reveals that many of these plans and initiatives fail to include and highlight the unique challenges climate change imposes on children. Further, they do not have any detailed mitigation strategies to reduce the impact climate change has on these vulnerable group. And when mentioned, children are lumped together with women. If we condemn our children to a life of poverty because they never got an education, or because they were married early due to climate change, where will our future scientists, doctors, educators, lawyers, and accountants come from? Clearly the world needs to do more: Governments and all stakeholders advocating for climate change need to put children first. First and foremost, climate policies documents must clearly state how they will mitigate the impact of climate change on children. At the same time, national governments and policy formulators need to come up with well thought out climate change strategies, adaptation and resilience programs to help reduce the impact climate change has on children. Secondly, to help address school dropouts, child marriages and other impacts of climate change, schools in developing countries or other countries heavily impacted by climate change should introduce school feeding programs. The UN World Food program must be applauded for their efforts to ensure children stay at school through their school feeding programs. However, it is time for the UNFCCC, World Bank and all other climate stakeholders and African countries to invest in school feeding programs as part of strategies to help children mitigate the impact of climate change. Indeed, policy makers and development organizations agree and have documented evidence that when properly implemented school feeding programs serve as incentives for children to attend and stay at school. And because they are not hungry, children can focus on their studies resulting in better performance. Furthermore, school feeding program would help remove a heavy burden on parents who cite the inability to feed their children as one of the reasons why they marry off the girls. Thirdly, we must ensure that schools-the place where many children spend their time have access to sustainable clean water supplies. The impacts associated with lack of clean water especially to children are dire; hence providing schools with water should be made a priority. A systemic review of over forty peer reviewed studies showed that access to water in schools helped increase girl child school attendance and positively impacted children’s health. World leaders, including French President Emmanuel Macron, Canadian Prime Minister Justin Trudeau, German Chancellor Angela Merkel, continue to demonstrate leadership in the fight against climate change and stakeholders including UNFCC, African Development Bank, The World Bank should consider rolling out a special initiative that addresses the plight of children. Children are the stewards of the future and we must protect them against the harsh consequences of a changing climate.